I "casino camped" across Michigan's Upper Peninsula and then traveled to my home town of Midland, MI in the center of the Lower Peninsula to spend time with my Dad for Father's Day. 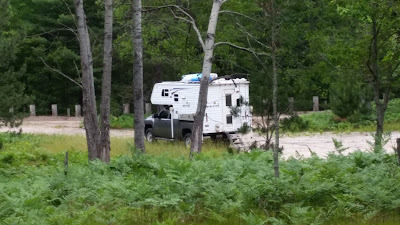 I wanted to do some true boondocking for the July 4th holiday and I consulted freecampsites.net once again to find a good spot in Michigan. 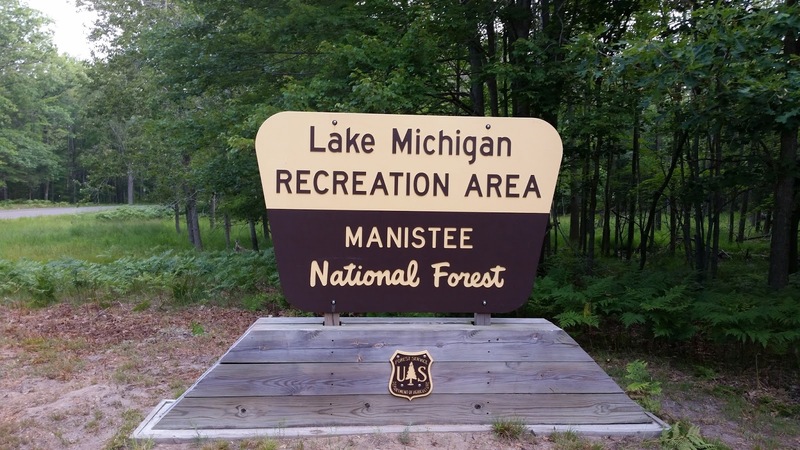 I settled on the Lake Michigan Recreation Area which is just south of the coastal town of Manistee and part of the Manistee National Forest. Usually the "National Forest" part of the area's name means free camping in designated areas for up to 14 days and the Lake Michigan Recreation Area is no exception. 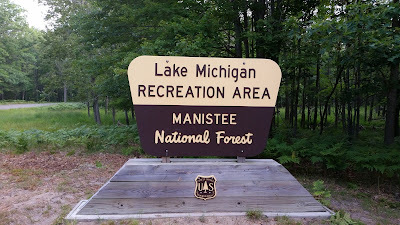 Manistee National Forest is one of only two Michigan National Forests. 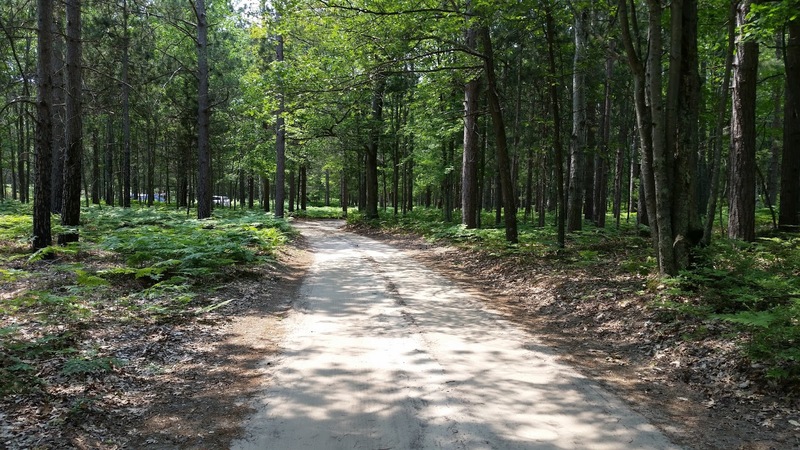 The designated camping area (besides the pay-site full service campground near the beach) is along a single lane dirt road called Green Road as it runs north and south of West Forest Trail Drive, which is the main east-west road through the Recreation Area. The Tank's campsite with Green Rd in the background. Most of the campsites are readily apparent as you drive south along Green Road and there's a sign that advises that camping is only permitted along the left side of the road. Green Road is a little tricky to find and I found it by having Google Maps open as I drove down the main east/west drag, the app identified Green Road on the map as I approached it. Most sites are nicely shaded which didn't work for a RV equipped with solar panels so I quickly snatched one of the few campsites with open view of the sky. Green Road, facing south, camping permitted on the left. 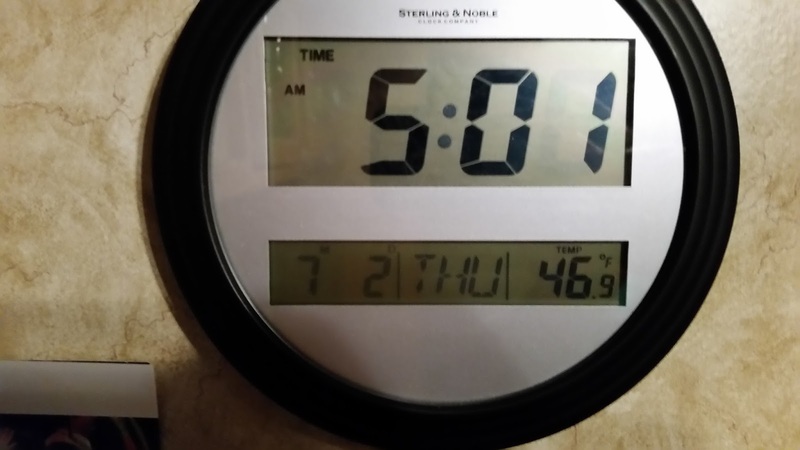 46 degrees F. in July! It was 5 degrees cooler outside. When you camp in Michigan in the summer you wear two changes of clothes, jeans and sweatshirts in the morning and shorts and tee shirts in the afternoon when it often got above 80 degrees...your basic 35 degree shift in five or six hours! The cool overnight temperature may have been responsible for the relatively light mosquito presence which was extremely welcome and unexpected. 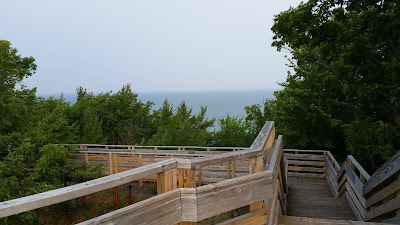 Of course the main attraction in the Rec Area is it's namesake, Lake Michigan, which is about two miles distant from the boondocking area. 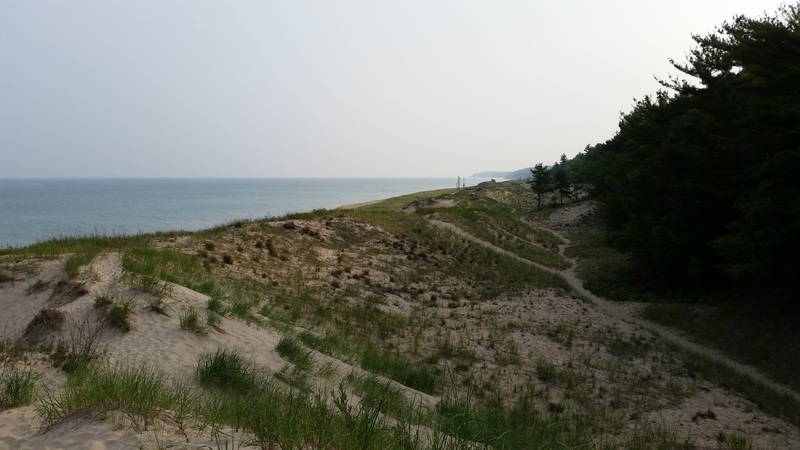 The sand dunes, narrow beach, and a calm Lake Michigan. The lake is approached through very sandy lightly grassed dunes down to a narrow but very nice sandy beach, the water felt too cold for swimming the morning I was there but in the afternoon with 85 degrees I might have been coaxed in. 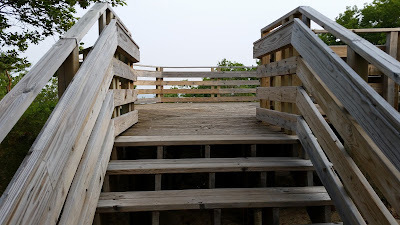 There is an immense wooden stairway that climbs a really steep hill that leads to an observation deck. The observation deck after about 2000 of those steps! 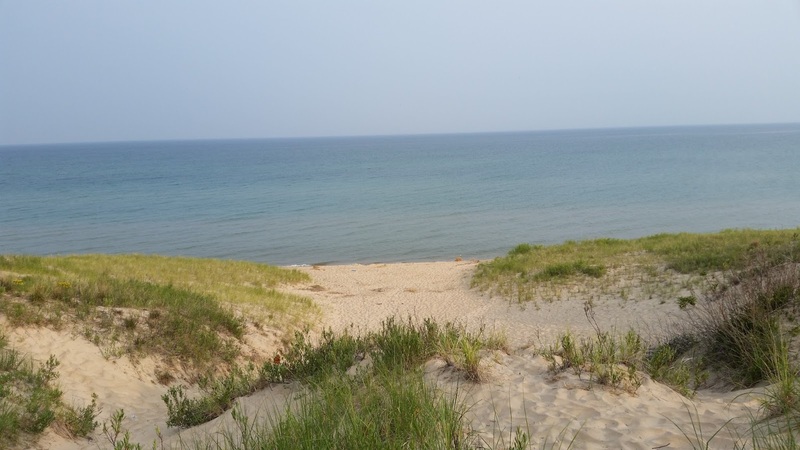 For someone looking for a quiet boondocking experience for up to 14 days the Lake Michigan Recreation Area fits the bill. 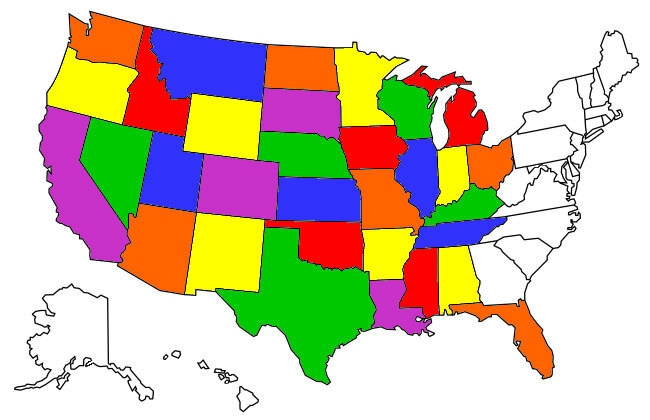 My only slight disappointment was the lack of extensive hiking trails you kind of take for granted in state parks. 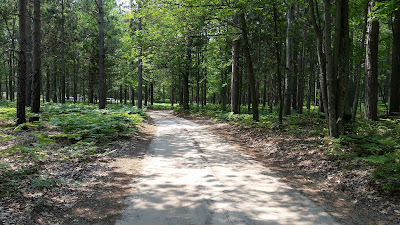 The Manistee National Forest is virgin forest so there really aren't hiking paths through it, I found some foot paths but these truncated fairly soon so I had to settle for getting my steps in by walking Green Road while keeping wary for vehicles approaching along the single lane road. Just a minor complaint though, I'll definitely camp there again in the future.